It wouldn't be Christmas without these M5 lights, also called mini ice lights, with a faceted lens on each bulb. Being LED's, these orange lights use substantially less power than other string lights and are much more durable. This heavy duty string of lights is part of the commercial grade series, and requires at least one unit of the commercial grade power cord, item C-APCORD-1G, to function. There are 25 LED lights on the strand. The green wire is 20 gauge. 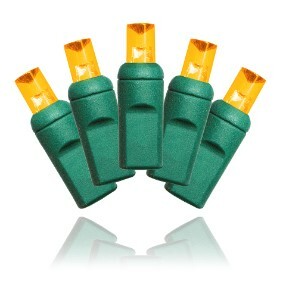 The total strand length is 12.5', including 6" between bulbs, a 6" end cord and a 6" lead cord. You can connect up to 10 strands together using the end-to-end connectors. UL listed for indoor and outdoor use. REQUIRES ONE UNIT OF C-APCORD-1G TO FUNCTION PROPERLY. POWER CORD IS NOT INCLUDED WITH THE SET.